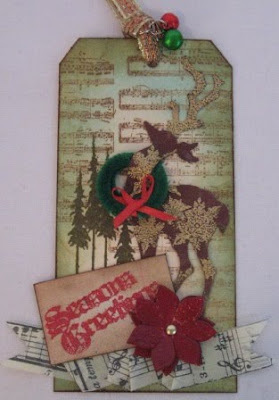 Here is a tag for Tim Holts 12 days of Christmas. He has finished all 12 now. I am a little behind on them. I did the deer this past weekend. I think this was number 7 or so. I did the one on the left at a local store this past week. I then made the other two at home after wards. My deer are made with two layers of hand dyed fabric that are fused with heat and bond. I then cut it out with the die cut and then added the embossed snowflakes. Sorry for the side ways look. It just happens now and then. This is a tag from earlier. I am not sure but maybe tag 5. I like the red of Christmas. I still have plans of making many more tags this next week or next. 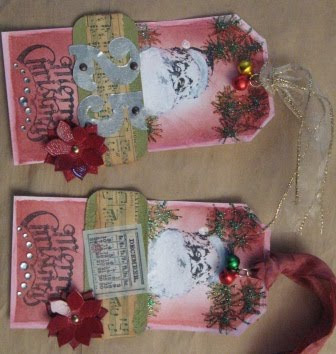 After Christmas I may try a make some tags that have the Valentines theme or make them in the form of a card. 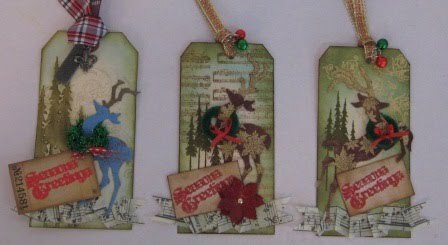 I love the vintage look with the many many layers of techniques. Wow those are super cute. I plan to do more and have a other posting next week with some new ones.